You’d love to enjoy a nice healthy breakfast every day of the week. After all, everyone knows that breakfast is the most important meal of the day. Sadly, we’re all also busy rushing around every morning trying to get to school or work on time, and that typically means grabbing a protein bar or something for breakfast. 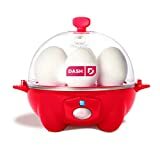 What if we told you that there’s a device that can cook perfect eggs every time in a bunch of different styles, and all you have to do to use it is press a single button? 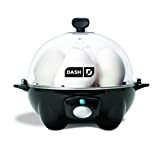 It’s called the Dash Rapid Egg Cooker, and it’s on sale at its lowest price ever right now in its two most popular colors — black and red!